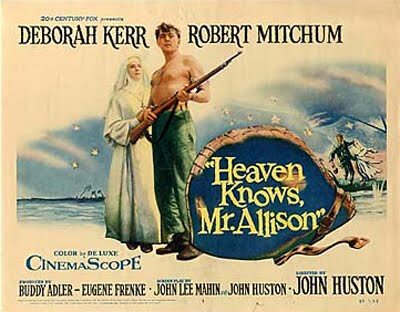 Heaven Knows, Mr. Allison – Did You See That One? 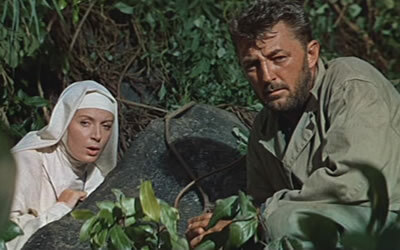 After a shipwrecked Marine (Mitchum) washes up on an island in the Pacific, he meets a nun (Kerr) who has stayed behind. Together they’re hoping to survive as they wait out the war. This is a dramatic look at war, based on the novel of the same name by Charles Shaw (Death is a Number). 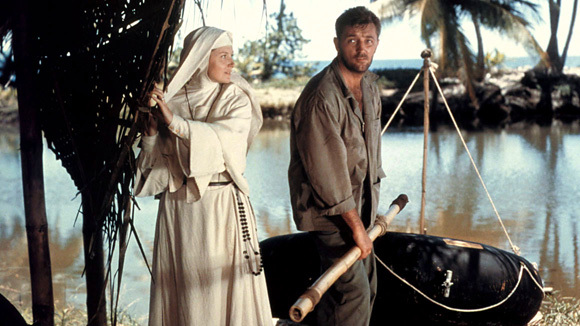 The film was directed by John Huston (The African Queen), who also wrote the screenplay alongside John Lee Mahin (Quo Vadis). The film stars Oscar nominees Robert Mitchum (The Longest Day) and Deborah Kerr (From Here to Eternity). This story comes from the 1952 novel of the same name, written by Charles Shaw. The screenplay makes several changes in terms of locations and timing, but otherwise holds true to the novel. The dialogue is nicely written and used sparingly, allowing the actors physical work to communicate much of the emotion. The writing also works in the great contrasts between the two characters. The differences between the nun and the Marine are nicely balanced with the subtle similarities revealed throughout the movie. The film pays off on several setups that really help to make this movie complete. The movie also takes a more personal approach to the war, similar to films like The Best Years of Our Lives. This intimacy really pays off in making this one work. The writing does a great job with this story, and it holds up very well after more than 50 years. The writing also earned the film an Oscar nomination for Best Adapted Screenplay. The acting in this film required two great talents to make things work in such a solitary story. Much like The African Queen, this movie paired up the right people for the job. Deborah Kerr plays a strong but vulnerable woman who really has to grow throughout the movie. 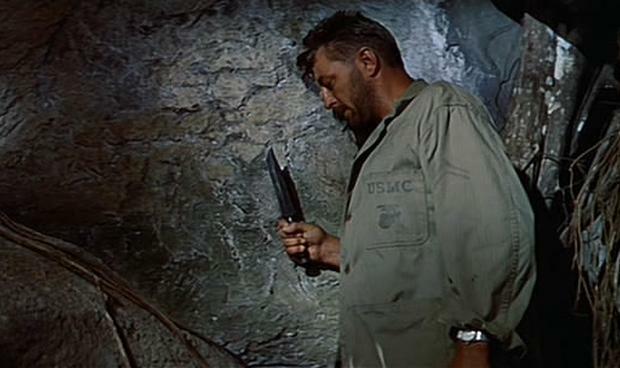 Mitchum does a great job as the hardened soldier who doesn’t believe in much outside of the Marines. These two have such great chemistry throughout the movie, and it plays so well with the great writing. Kerr would earn one of her six Oscar nominations for her work on this movie. This movie was filmed in Trinidad and Tobago, utilizing the natural beauty of the landscape in contrast with the war raging in the story. This CinemaScope film features good cinematography by Oswald Morris (The Guns of Navarone). In addition, the movie has great costuming and visual effects. Overall, this one holds up wonderfully. If you’re a fan of war films this is one to check out. I would also suggest this one to fans of the two great stars or the legendary John Huston. I give this one 4 out of 5 stars. Pingback: The Friends of Eddie Coyle | Did You See That One? Pingback: The Asphalt Jungle – Did You See That One?